On Friday, 5th September 2014 the European Garden Awards by EGHN and the Schloss Dyck Foundation with support by Lorenz von Ehren Nursery were awarded for the fifth time. Instead, a tiny room was discovered, buried under fallen masonry in the corner of one of the walled gardens. A motto etched into the limestone walls in barely legible pencil still reads “Don’t come here to sleep or slumber” with the names of those who worked there signed under the date – August 1914. This was the start to bring these glorious gardens back to life in every sense and to tell, for the first time, not tales of lords and ladies but of those “ordinary” people who had made these gardens great, before departing for the Great War. 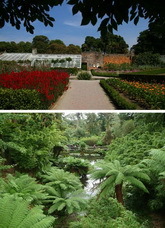 The gardens include aged and colossal rhododendrons and camellias, a series of lakes fed by a ram pump over a hundred years old, highly productive flower and vegetable gardens, an Italian garden, and a wild area filled with sub-tropical tree ferns called “The Jungle”. 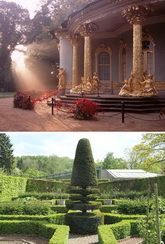 The gardens also have Europe’s only remaining pineapple pit, warmed by rotting manure, and two figures made from rocks and plants known as the Mud Maid and the Giant’s Head. The gardens are now leased by a company owned by their restorers, who continue to cultivate them and operate them as a visitor attraction. There is a large working team with its own vision for the third decade. The team intends Heligan to remain a living and working example of the best of past practice, with a contemporary focus on working with nature and protecting and enhancing the variety of habitats. Not far from the Stuttgart State Academy of Art and Design and the Weißenhof, and next to the grounds of the former Reichsgarten horticultural show, this former trade fair ground was developed as a new urban district with a focus on creative industries and housing. 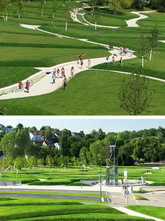 Much like a ‘Green Joint’, a large-scale extension to Killesberg Park is the green heart of the new quarter, adding new features of present-day landscape design: “Zukunftspark Killesberg”. The new park is the result of the fusion of two themes characterising Killesberg: smooth, near-natural landscape and man-made quarries as hard topographies. In terms of space, the latter theme has been implemented by superimposing enormous masses of earth onto the former quarry areas and show grounds – smoothing out irregularities – and by a new topography of lawn cushions between path systems. This project was carried out in a participatory process of local authorities as well as citizens and neighbours providing an understanding of the design intent and a convincing basis for subsequent decisions. Hill-shaped pads of grass, traversed by a tightly knit network of paths, make the experience of the park even more alluring. The animated topography and the lowered paths offer visitors a wide range of perspectives when sauntering through the park. As Killesberg has always been a place of trees, the new design of the parks includes empress trees, hedges of crab apples as well as old fruit tree species extending into the residential area. Thus there is a mix of local tradition and exotic aliens. The residential houses are grouped around a garden courtyard. This courtyard is characterised by grass-covered parterres sheltered by a roof of trimmed historic fruit tree varieties. Individual hedge bordering and pavements give each of the housing clusters its own character. The demolition of a multi-storey car park uncovered the Rote Wand, a natural landmark of red sandstone reminding of the former use as a quarry. Traditional design purposes rooting in Romanticism have been translated into the form of a spatial invitation to a stroll through new worlds of experience of organic landscape and nature. External link to Rainer Schmidt Landschaftsarchitekten. External link to Pfrommer + Roeder Landschaftsarchitekten. 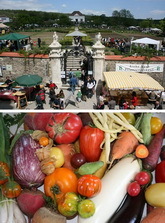 ARCHE NOAH was established in 1990 on the initiative of heirloom – gardeners, farmers and journalists, concerned with the future of seeds and old varieties. ARCHE NOAH responds to the loss of agro-biodiversity with a positive vision and numerous activities. This demonstrates how all of us can contribute to more diversity through cultivation of threatened varieties in the garden, through shopping awareness and political commitment. This attitude connects more than 8.000 members involved. It is to look at our cultural plants respectfully, to value gardening and farming as a cultural achievement, to consider ethically motivated consume as a contribution to organic and sustainable agriculture, to make cooking a declaration of love. ARCHE NOAH’s garden is located in the valley of the River Kamp not far from the City of Krems/Donau, in a small town called Schiltern. Through a beautiful wrought-iron gate visitors enter a formal baroque garden – today home to hundreds of rare cultural plants grown organically. There is something for everyone at ARCHE NOAH´s Garden – for gardeners, farmers, shoppers, children and those simply looking for a relaxing day out. Over the season, visitors can always find something new to explore in the garden. More than 30.000 visitors yearly are attracted by the beautiful garden with its huge diversity shown. The ARCHE NOAH Seed Bank is one of Europe’s biggest private collections of cultural plants, maintaining over 6.000 accessions of rare vegetables and grains – many of them are not to be found in any other places any more. The breeding, description und research on these plants is carried out in a special (organic!) breeding garden. There are also huge collections of fruits and berries, which are partly kept in the visitor´s garden, but mostly they have been “adopted” by members and are preserved in different private orchards. Furthermore the maintenance of more than 200 rare potato varieties is really hard work – all the varieties have to be planted and harvested every single year. Organic farmers from the region “Waldviertel” assist in fulfilling this task. External link to Arche Noah. Green zones, wedges or corridors are far from new invention. But there are signs of a comeback of green zones and networks in urban planning, this time under the auspices of multi-functionality and climate change adaptation. In Finland, the need for more intensified land use and urban infill puts great pressure on valuable urban environments like green areas and historical quarters and can lead to short-sighted, scattered development and to loss of sense of a place. One policy to avoid this is very successful – the National Urban Park (NUP). The initiative to be accepted as a NUP and the relevant charter come bottom-up from the city government. The Ministry of the Environment grants the charter but has also a consultative role in the application and further development processes of the NUP. The NUP zone must fulfil the following criteria and must fit into the operative city plans: diverse environments, including urban biodiversity, cultural historical structures, scenic parks and green areas, the inclusion of the central urban core area, undisturbed and extensive green and recreation areas and interconnections with a possibility to walk from one district to another, and ecology and continuity with corridors and links to natural, rural and forest areas outside the city centre. The National Urban Park status does not exclude development, from which may follow land use conflicts. Any major change in regard to the central values of National Urban Parks must be negotiated between the city representatives and the Ministry of the Environment. The network has so far six NUPs with different cultural and natural landscapes, townscapes, historical characteristics, and biodiversity as well as social, recreational and other special values. 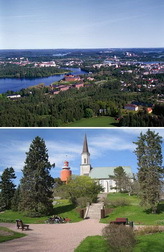 The network of National Urban Parks provides the most valuable Finnish urban environments. A NUP also represents image value to the cities, which indeed is one of the key motives for their foundation. 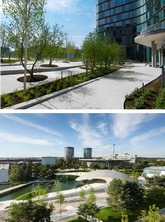 At the same time, NUPs are everyday outdoor living rooms for citizens and visitors.